In our previous lesson, we have learned about the Post and Comments settings of Blogger. 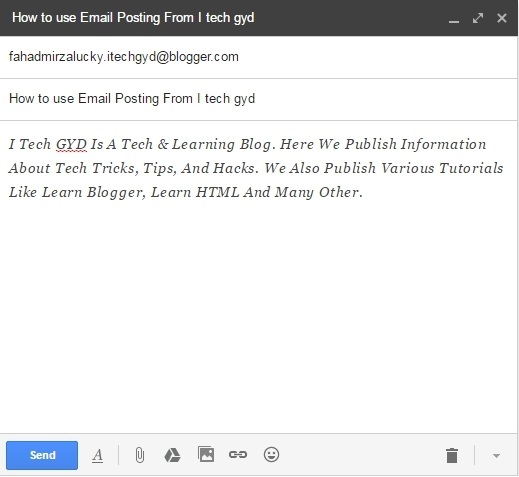 Here in this article, I will teach you about the Email settings for blogger. 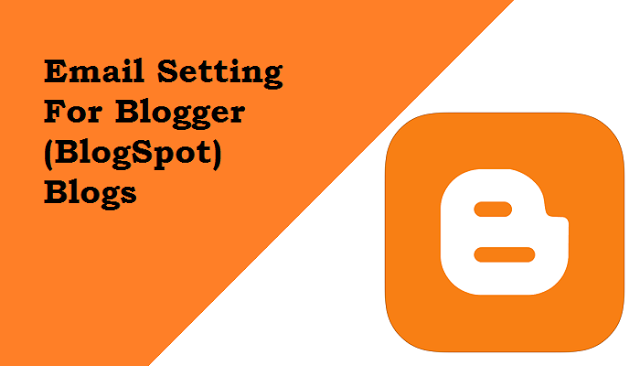 What is Email Setting in Blogger? Email settings include three options and all of them are for emails. These are Posting using email, Comment Notification Email and Email posts to. We will discuss each of these options carefully so that you can understand them. This option is also known as Mail2Blogger (Mail To Blogger). By using this option you can post images and text to your blogger blog directly to your blog. But it is limited 10MBs. I have entered itechgyd as secret words. Now login to your Email account and compose an email enter the email like this youremail.secret [email protected] Finally, click on the Send button. Your message which you sent will be saved as a draft post for your blog. If you want to see then Login to your blogger account and go to the post there you will see the post. When any visitor gives a comment on your blog you can see that in the Comment Moderation box but if you want to get notified about the comment then you can also get a notification email in your email. Just click on the “EDIT” button in front of Comment Notification Email and enter the email where you want to get notifications about new comments. Remember you can add up to 10 emails which will be notified about the comment. This option is very useful for notifying your friends about new posts. If you want to share your blog posts with some friends then you can use this option. Click on the “EDIT” button in front of “Email posts to” and enter up to ten email address they must be separated by commas. Now whenever you will publish any new post that will be mailed to these emails. Email marketing is best from the beginnings. The worth of email marketing has been so increased for bloggers. 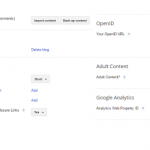 Google also tells that why we’ll do email marketing. If someone have learnt the art of email marketing, i am sure no one can beat him in online field. But knowing about email marketing takes time and in the beginning, you have to learn the basics about this and you can start it with blogger platform. In this guide, you’ll learn the basics of e-marketing with blogger and it is totally free for everyone. Also, this is easy way and you can learn it in days. So i suggest you to take start with it and do your work with full focus. Once you learn the free methods, then you can go with the paid ones because you’ll become pro till then. Many people wants to learn about e-marketing, but they can’t find any proper source of doing this. So, here you can learn from scrap and can practice for free. I hope you all understood about this topic and i am sure you’ll try it soon. I assure you, you’ll enjoy it very much if you gave full focus to it. Share this post with your friends and let them also know about e-marketing with blogger and how to setup blogger email list from scratch.